Sri Lanka 4-87 (Tillakaratne Dilshan 50*, Dimuth Karunaratne 14, Nathan Lyon 1-0) trail Australia 5-450 declared (Michael Hussey 115*, Phillip Hughes 86, Michael Clarke 74, Chanaka Welegedara 3-130) by 363 runs. 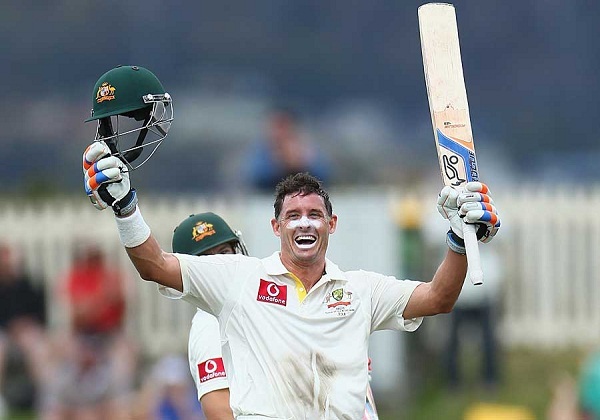 Michael Hussey smashed another ton as the decision of declaration by Michael Clarke paid off and Australia got rid of four top order Sri Lankan batsmen. Australia hammered 450 runs in 131 overs after losing five wickets when Michael Clarke declared the first innings and Sri Lanka scored 87 in 29.1 overs for the loss of four wickets. The second day’s play came to an end on Saturday, December 15, 2012, at Bellerive Oval, Hobart. Earlier, the Kangaroos started the day at 4-299 after consuming 90 overs, Michael Clarke and Michael Hussey were unbeaten for 70 and 37 runs consecutively. The Lankan Lions got an early breakthrough when Clarke was caught by Kumar Sangakkara in the slip off Shaminda Eranga for 74 on the first ball of the 93rd over. Matthew Wade got together with Hussey as the home team reached 320 after 100 overs. 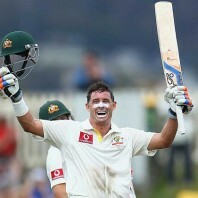 Michael Hussey got his 30th Test fifty three overs later with a couple of fours as Wade kept on consolidating from the other end. Matthew Wade was dropped by Suraj Randiv at midwicket off Chanaka Welegedara at 24 on the fourth delivery of the 109th over. The score board kept on moving as the fourth hundred was displayed on the screen in 124 overs. Wade attained his 2nd Test fifty on the first delivery of the 127th over as Angelo Matthews dropped Hussey at deep midwicket on the very next ball at 96. 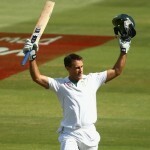 The dropped catch resulted in the 19th Test ton for Michael Hussey since the ball crossed the rope. 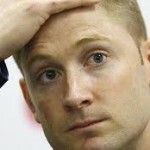 The Australian captain, Michael Clarke declared the innings at 5-450 in 131 overs. Michael Husey was batting at 115 off 184 with 1 six and 8 fours and Matthew Wade secured his end at 68 in 135 deliveries with 5 fours. Chanaka Welegedara was the top wicket taker with three and Shaminda Eranga claimed one wicket. The Sri Lankan innings was opened by Dimuth Karunaratne along with Tillakaratne Dilshan and they took the score to 21 in 7 overs at tea break. Karunaratne was caught behind by the wicketkeeper Wade off Ben Hilfenhaus for 14 on the third ball of the 10th over. 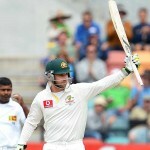 The experienced Kumar Sangakkara joined in with Dilshan who dispatched 3 fours in the 13th over bowled by Peter Siddle. The poor form of Sangakkara followed him when he was gone for just four runs as the score reached 42 in 14.4 overs. The skipper of Sri Lanka, Mahela Jayawardene, got together with Dilshan and the first hit two back to back fours in the 18th over. Dilshan continued sparkling from his end with regular boundaries as Jayawardene was declared leg before wicket off Shane Watson for 12 runs after Review was taken by the fielding side. Thilan Samaraweera was the next batsman who took guards in the centre as Tillakaratne Dilshan achieved his 22nd Test fifty in the 29th over with 2 fours. Samaraweera lost his wicket on the first delivery of the next over for seven as the Islanders were reeling at 4-87 when the bails were taken off on the second day. Dilshan was unbeaten for 50 scored off 85 balls with the assistance of 8 fours. Ben Hilfenhaus, Nathan Lyon, Peter Siddle and Shane Watson shared one wicket each as Mitchell Starc remained wicketless after bowling seven overs. Australia is in a commanding position as Sri Lanka trail by 363 runs and still requires 163 to avoid the follow on with six wickets in hand.